Welcome to the Ultimate Party Bus Limo Bus and Charter Bus Service. We are a premier limousine Bus and hummer limo Service serving South Florida since 1990. The Ultimate Party Limo's were built to be the "Ultimate Entertainment Limousines." Ultimate because we went far beyond the limits of any traditional limousine. If your looking for a Party bus, Limo bus or Charter bus from West Palm beach to Miami Beach, Boca Raton, Fort Lauderdale, and Hollywood. We are the solution! Our Limo Bus service is great for Corporate Travel or A night out on the town. Are you Planning a Corporate Event,Bachelor Party,Bachelorette Party, Birthday, Prom, Homecoming, Kids Party, Office Party,Sporting Event. Corporate Functions, Cruise Transfers, or Christmas Party. 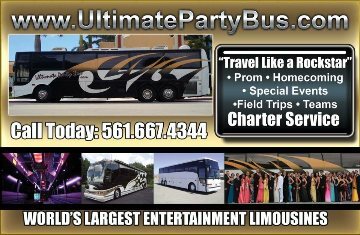 Take a look at our Full Size Party Bus, Limo Bus, Charter Bus Service. Ultimate Party Bus is far beyond any limousine weather you need Professional Corporate Transportation or No-Holds-Barred Party till dawn rolling VIP/Sports Lounge call the Ultimate in Transportation. We use full size Motor Coaches the same tour buses that entertainers travel in. That's why we have been Called "THE ROCK STAR BUS" Party Bus. We Specialized in Limo Bus transportation and party bus rental service in West Palm Beach to Miami Beach and all the cities in Dade, Broward, St. Lucie and Martin Counties, including Fort Lauderdale and Boca Raton. Since Our First Party Bus in Miami Our Company Has Grown from Charter Bus Service to Limo Bus Service and Everything in between Including Hummer limo ,Limo coach, Limousine Bus, Party Bus Limo, Corporate Bus and Limousine Services. Now we service All of South Florida! Ultimate Party Bus and Hummer Limo Experience, lives up to it's name.